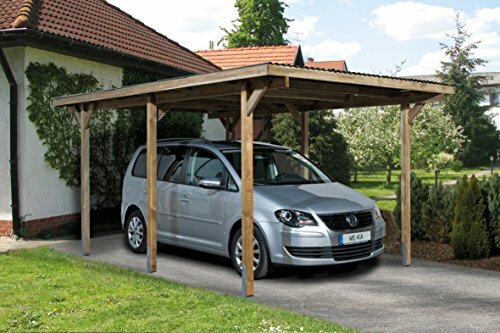 Very good value standard Weka carport. Due to the construction made this carport guarantees Snow loads up to 85 kg/m² thanks to 9 x 9 cm posts and large head bandsTechnical details - Weka carport Primus Size 1 KDI: Dimensions (Width x Depth): 268 x 389 cm Roof Stand (W x D): 300 x 500 cm for height: 223 cm for inner width: 250 cm Post Spacing: 181 cm Width of posts: 9 x 9 cm A Number Of Posts: 6 roofing material: PVC corrugated profile, black Maximum Snow Load: 85 kg per square meter) design: Nordic wood, pressure treatedProduct Features Weka carport Primus Size 1 KDI: posts: The posts of the Weka carports are made from high quality Nordic wood. These posts are for better weather protection Pressure Treated. With this coating system will be chemical salts under high pressure eingepresst in the wood. Hieraus thanks to the a high resistance of the wood the Weka carports mould and mildew, caused by fungus Holzzersetzendes against pests. The head bands which can be screwed onto the vertical post height increase the contact area for the horizontal Rafter. By this method of construction means that it is easy to assemble the carports of Weka timber construction. Roof: The roof of the Weka carport Series leader is made from PVC wavy profile roof sheets. Dadruch it is quick and easy to put up the roof.Box Contents Weka carport Primus Size 1 KDI: Weka carport will be ready to assemble, includes installation materials. General. Instructions for comes and included in the delivery): contain for part accessory, which is not included. Please refer to the item description The Exact box contents. Lieferservice: Wir liefern Ihr Carport per LKW mit Spezialausrüstung bis zur Bordsteinkante. ACHTUNG!!! Die Straßenanbindung muss für einen 38-t-LKW befahrbar sein und breit genug sein, um straßenseitig abladen zu können.